The Australian Floral Art Association Inc. is a constituted not-for-profit organisation that serves as the parent body for floral art in Australia. The property and income of the Association shall be applied solely towards the promotion of the Objects or purposes of the Association and no part of that property or income may be paid or otherwise distributed, directly or indirectly, to members of the Association, except in good faith in the promotion of these Objects or purposes. Queensland (Qld) – The Floral Art Society of Queensland Inc.
Western Australia (WA) – West Australian Floral Art Society Inc. The Northern Territory (NT) does not have representation at present. Until September 2012 a Management Committee was provided in rotation by member States and Territory organisations. Now the National Management Committee (NMC) consists of representatives from the State and Territory organisations. This committee deals with the running of the Association in accordance with the constitution and resolutions approved by the member organisations. The term of office is approximately three years. The Association meets each year. These meetings are hosted by the listed State and Territory organisations. Many decisions affecting the Australian Association are dealt with at these meetings, others by correspondence or electronically. Each State and Territory is entitled to two delegates and one observer at all official meetings of the Association. 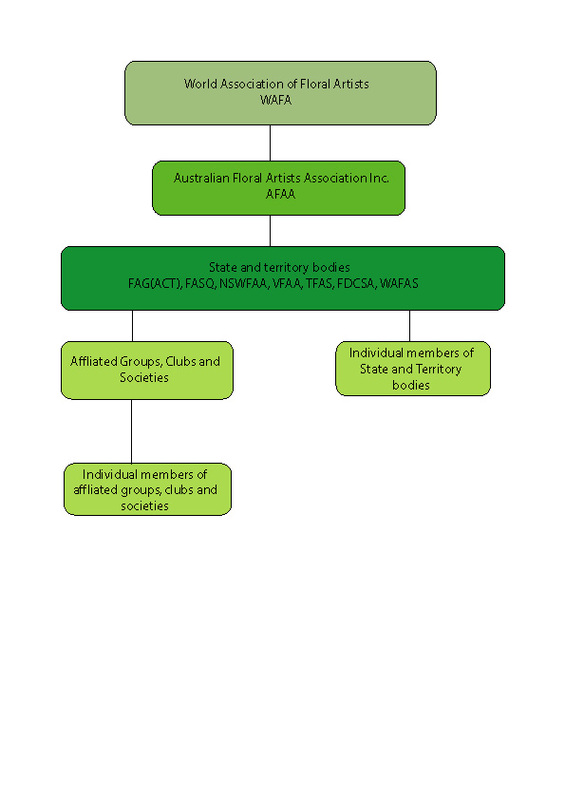 While individuals and affiliated club members do not have direct voting rights at AFAA meetings, these may be exercised at “grass roots” level, at member organisation State meetings, when business relating to the AFAA is being developed and determined. The funds of the Association are used for the promotion of floral art and judging within Australia, and for any international events approved by the Association. Revenue is derived from affiliation fees from the State and Territory members. Donations from these members, their affiliated clubs, and other persons are the major income sources. Sale of Australian Association badges, souvenirs and the magazine provide some revenue, while sponsorship is also sought for major events. The Association’s official newsletter bears the Australian Floral Emblem, Acacia pycnantha. The AFAA emblem was originally designed by the late Mrs. Elsie Holden, Qld, second chairman. In 1995 an Association badge was struck carrying the AFAA emblem. The Australian Association was an inaugural member of the World Association of Floral Artists (WAFA). Thirty one countries are now members of WAFA. Australia has been represented in various ways at each WAFA show and seminar held to date.